President Trump has been pointing the finger at the way California manages its forests as the reason for the deadly wildfires that have swept across the state. During a recent visit, he held up the example of Finland as a country that spends time "raking and cleaning" its forests to reduce the risk of fires. He had already suggested that California was not managing its forests properly - despite receiving "billions of dollars" each year. The California Professional Firefighters said the assertion forest management policy was to blame was "dangerously wrong". The International Federation of Firefighters - which represents members across the US and Canada - attacked President Trump for suggesting he might cut off funding. What is the situation in Finland? Finland has large forested areas - but Finns were not quite sure what President Trump was referring to when he talked about them "raking". Prof Pekka Leskinen, of the European Forest Institute, told BBC News it could have been a misunderstanding during President Trump's conversation with his Finnish counterpart. Finland also benefits from a network of volunteers who make up an effective early warning system, thus enabling fires to be doused before they spread. In California, nearly 60% of forested areas are managed by national agencies such as the US Forest Service, the Bureau of Land Management and the National Park Service. And there's a significant amount in private hands as well. The actual amount managed by the California state authorities is small - but the California Department of Fire and Forestry Protection is responsible for putting out fires and prevention measures in privately owned areas. The US Forest Service has a budget of $4.73bn (£3.64bn) for 2018, of which $2.4bn is for "fire suppression and preparedness"
The National Park Service's anticipated budget for 2019 is $2.2bn, with $289.2m for "resource stewardship"
We don't know exactly what amounts are spent on measures to reduce fire risk on land they manage in California. But concerns have been voiced about whether there's been enough emphasis on longer-term fire prevention. He believes more focus needs to be put on more sensible management of the environment and better land use to avoid "catastrophic burning". Tom Bonnicksen, professor of forest science at Texas A&M University, says the real issue is that there are too many trees in California's forests. "But in the recent century or so, the emphasis has been on putting out any fires - and with climate change this has now created a tinderbox of vegetation," Prof Doerr told BBC News. There's little doubt fires have been getting worse in California in recent years, both in terms of their destructive power and their size. And in terms of loss of life and damage to property, the data shows the worst fires have all been in the past 10 years or so - except for one fire in 1991 in Alameda County. 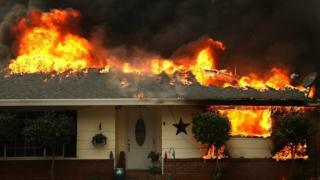 A report by the US Department of Agriculture in 2010 noted that by that year more than 11 million people out of a population of some 37 million in California were living in such areas - and flagged the fire risks this posed. There's little doubt that unless some of these issues are addressed, the costs to California - as well as to Washington - will grow.